To work with a virtual document, you must be able to identify a specific data item within it. The data item is called a virtual property. An virtual property path is the syntax that Ensemble uses to specify the location of a virtual property. Except for XML virtual documents, you can use virtual property paths only if you have loaded the applicable EDI schema into Ensemble. 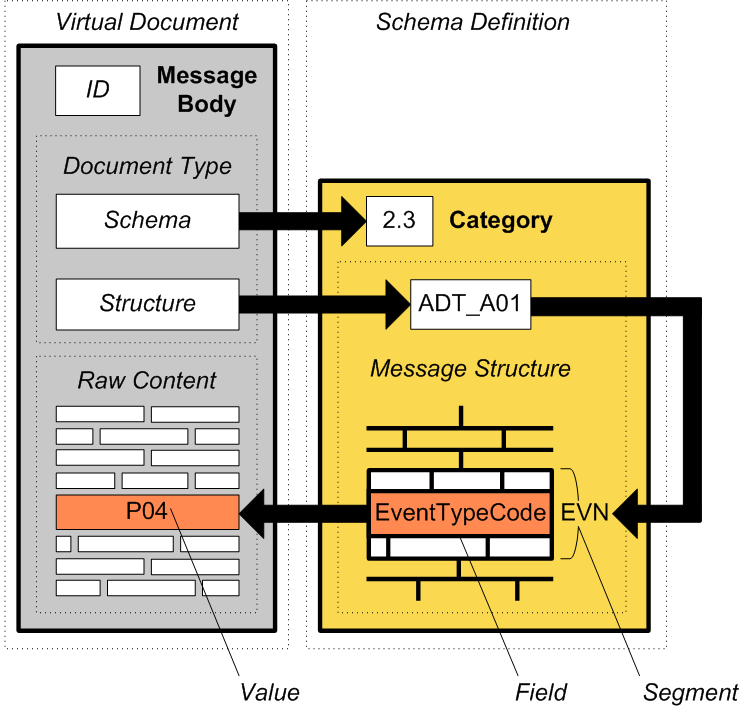 Once the schema is loaded into Ensemble, Ensemble has all the information necessary to parse the corresponding documents as intended by the EDI schema. A terminator character (often a carriage return) marks the end of the segment. In this case, each line is a segment. Within a segment, separator characters mark the boundaries between fields. In this case, the colon is the separator character between fields and the semicolon is the separator between subfields. A field can contain sub-fields and further subdivisions. These are delimited by other separator characters. The details of the terminator character and separator characters depend upon the EDI format. The fourth character (by default \) is used to escape characters rather than separate fields. The fourth character (by default &) is used to escape characters rather than separate fields. The following figure shows how Ensemble parses an ASTM document. It shows the document as displayed in the Document Viewer page, described in Portal Tools, later in this book. The following figure illustrates this convention. The Management Portal provides pages to help you determine the correct segment:field paths. (To access these pages, click Ensemble, and then click Interoperate.) The DTL editor also provides a view of the document structures used in a particular transformation. To work with virtual documents, there is no need to create message classes. Ensemble provides message classes, for example, one class to carry X12 documents, another for HL7 messages, another for XML documents, and so on. The business host classes automatically use the appropriate message class. These messages are known collectively as virtual documents. structure is the name of a document structure within the referenced category. This property is visible in the Management Portal. You can use it for filtering, for example. Contains the first 32 KB of the raw message. This property is also visible in the Management Portal and is useful in analyzing and reporting badly formed messages. Note that this property is not indexed in any way. If you were to use this property in an SQL search query, the query would not execute very efficiently. It is not recommended to access this property programmatically (for example from a DTL). Instead, use virtual property paths to access the data that you need. Use the macro $$$ISOK(myHL7Message.BuildMapStatus) in ObjectScript and the method $SYSTEM.Status.IsOK(myHL7Message.BuildMapStatus) in Basic. If the test returns a True value, BuildMapStatus contains a success value. Use the macro $$$ISERR(myHL7Message.BuildMapStatus) in ObjectScript and the method $system.Status.IsError(myHL7Message.BuildMapStatus) in Basic. If the test returns a True value, BuildMapStatus contains a failure value. Returns the value of a virtual property in the message, given a virtual property path. You can invoke this method (and the next one) from any place in the production where you have access to the message and you can execute custom code  for example, within a BPL <code> element. Sets a value in the message, given a virtual property path and a value. See the comments for GetValueAt(). Create a string that contains the text of a suitable document. Use the ImportFromString() method of the applicable virtual document class to create an instance of a virtual document from this string. Set the DocType property of this instance. Use the GetValueAt() instance method of this instance.